Emergency services on scene of the crash in Oakey this morning. Photo: 7 News Toowoomba. POLICE have identified a young man killed in a fiery crash at Oakey on Monday as a Darling Downs local. Investigations are continuing into the crash which claimed the life of 26-year-old Christopher Grosso. Mr Grosso was the sole occupant of a 4WD which left Oakey Crosshill Rd and struck a power pole about 1.40am Monday. The vehicle caught fire and Mr Grosso died at the scene. 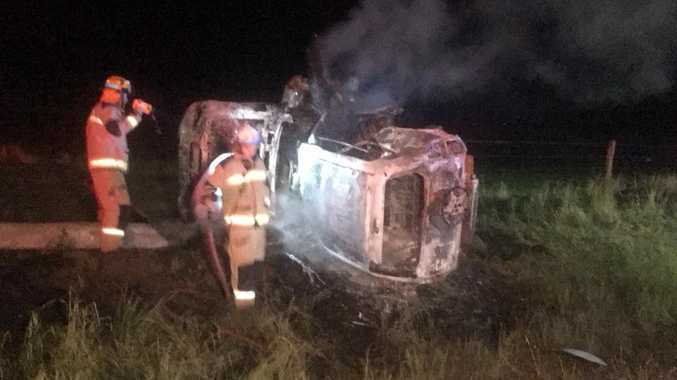 Darling Downs Country Patrol Group Acting Inspector Tony Neumann said investigations into the crash were continuing, and appealed for help from the public. "(Police ask that) anyone who had contact with Christopher on the Sunday prior to the accident to contact police," he said. "We are keen to speak with anyone (who saw Mr Grosso) on the Sunday prior." Forensic Crash Unit investigations are continuing.